Claire Hooper started on the stage – crafting engaging, innovative live shows that blended stand-up, theatre and some hammer dancing. Her 2006 show, ‘Oh’, earned her both critical acclaim and a nomination for the Melbourne Comedy Festival’s Best Newcomer award. A born storyteller with a sharp wit, Claire has gone on to regularly perform at festivals and comedy rooms all over the country. For four years Claire shared a set with Paul McDermott and Mikey Robbins on the iconic comedy show Good News Week as a team captain. 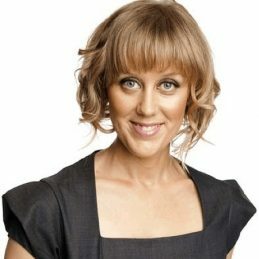 She has also appeared on Rove and The Melbourne Comedy Festival’s Great Debate and Opening Night Gala. Over the last decade, Claire has been captivating audiences and touring brilliant solo shows across the country to critical acclaim. She returned to the stage in 2018 with her brand-new show All The Rage, touring comedy festivals around Australia. In 2015 Claire scored her dream job, as co-host of The Great Australian Bake Off for Foxtel’s LifeStyle Channel alongside the seriously funny Mel Buttle, as well as judges Maggie Beer and Matt Moran and they have just shot their fourth season.